In a recent interview, British star, Amir Khan stated that should he defeat Saul “Canelo” Alvarez this Saturday night for the WBC Middleweight title that he would not rule out the possibility of facing Gennady “Triple G” Golovkin. That’s a scary thought, far more scary than what might happen to him this weekend against an opponent who will outweigh him by a substantial margin come fight time. And what may be scarier than all possible scenarios is that Khan really means it. Call it delusional if you’d like but in this day of false bravado and bluffing from behind layers of politics, Amir Khan actually means what he says. A fighter like this should be lauded. Instead, Khan is being treated like a sideshow. Forum boards are littered with criticism of his technical flaws, his suspect chin and his overinflated view of his own abilities. All of these are to a certain extent, true. Amir tends to get lost in the middle of his own speedy combinations which gave Colombian puncher Breidis Prescott and current WBC welterweight champion Danny Garcia perfect tees for their left hooks, the former ending matters in 54 seconds Then there were even uglier signs of his lack of durability, being dropped and badly hurt by faded veteran Julio Diaz and then staggered by Chris Algieri. Through it all, Khan maintained that he would be the guy to beat Floyd Mayweather Jr. and he tweeted endlessly (and obnoxiously) to make headlines. It got to a point where his self – promotion backfired, with fans becoming so sick of his conceited ramblings that the focus shifted to his negatives rather than all the good things he’s done. Inserted neatly between his career fails are some pretty impressive performances. After the Prescott fiasco, Khan managed to rattle of some nice wins against Marco Antonio Barrera, Andriy Kotelnik (to win the WBA super – lightweight weight title), Dmitriy Salita and Paulie Malinaggi. But the public still wasn’t convinced because those opponents were either too small, past their primes or too light – fisted to give any indication that Khan would fare better against a fighter who could really test that jaw of his. Enter Marcos Maidana. Now if anyone was going to remind us of Khan’s supposed Achilles heel, it was definitely going to be Maidana. The Argentine slugger wasn’t a particularly sneaky puncher – he may as well have yelled out what was coming- but he threw lots of punches and he wasn’t the type to become easily discouraged. He was going to find out what you were made of as he did when he put a dent in Victor Ortiz’ career.In the first round “El Chino” went down from a left hook to the body and it looked like Khan was going to get off without having to answer any questions about his beard but in what turned out to be one of the best things that ever happened to him, Maidana didn’t stay down. He got up, dusted himself off and proceeded to make the next eleven rounds absolute hell for his more celebrated opponent. It was the kind of fight someone as supposedly brittle as Khan shouldn’t have won but he did.He took it on the chin, gutted it out and fought back, all in one night. The doubters were silenced, at least temporarily. But true to what has been erratic career, Khan lost a split decision to Lamont Peterson a few fights later despite being a heavy betting favorite. Rather than using his speed to his advantage, Khan seemed listless, allowing himself to just lay on the ropes and allowing the Washington D.C native to just blast away. The rumors of Khan being at less – than – his best because of struggles making weight seemed legit but he denied them, instead pointing out that the he would have won had he not been deducted two points during the contest and that the scorecards had been tampered with.When Peterson was later stripped of the title for testing positive for a synthetic testosterone, Khan’s ego came back even stronger as he now had a legitimate reason to justify the loss. He decided to go after Garcia for the WBC version of the super- lightweight title and again, was favored to win big. For the first two rounds, the odds in Khan’s favor played out as planned. He was the “Swift” one in the ring, freezing the Philadelphia fighter with multiple combinations when the chin issue suddenly came roaring to the surface. He was flattened in the fourth round.Two fights later, he would go life and death with Diaz, looking vulnerable in that sad way that shot fighters seem to look. Amir Khan’s was plummeting. He was back to being a sidebar for articles written for the Mayweather’s and Pacquiao’s of the game. He needed to build himself up once again but rather than take baby steps as he’d done after his first loss, “King” Khan decided that it was time to sink or swim. Khan moved up to welterweight and scored two consecutive victories over respected contenders Luis Collazoand Devon Alexander. He didn’t just win, he shined, looking very much like the force he always seemed capable of becoming if he could just put it all together. He carried the extra weight very well and seemed rejuvenated. The addition of esteemed trainer, Virgil Hunter, took some time to gel but it eventually did just that with Khan looking as fast as ever but far more composed. Everything was back on track. Sort of. Chris Algieri was supposed to be a walk in the park and Khan let everyone know it. He told us that it was nothing more than a stay – busy fight until Mayweather gave him his big chance. And the way he’d been fighting, there was no reason not to believe him. But as had been the case before when Khan was getting ahead of himself, things got complicated. He fought under his abilities and was tagged with alarming ease and hurt more than once against a fighter whose right hand will never make anyone forget Thomas Hearns or even, Marcos Maidana. Once again, the critics were quick to come out in force, “same old Khan”, they said, “weak chin”, “bad balance” etc. And they’re right. But this is why I think he has a better – than – expected chance this weekend than most are giving him. In the weird and wacky world that is Amir Khan’s boxing career, things actually make more sense than they appear upon first glance. Amir’s success it seems, is based upon what threat he perceives his opponent to be. An overconfident Khan is bound to disappoint because his mind seems to be elsewhere, maybe dreaming of the spotlight which has twice ended up being the doctor’s penlight. But a Khan that is backed up against the wall, the version of the fighter who feels that his status is slipping away, is hard to beat. When he’s on his game, Amir knows how to control a fight and make it nearly impossible for his opponents to catch up. He’s such a strange dichotomy; his experience really defies conventional explanation. Sure, you can call his ups and downs a simple case of styles making fights but that wouldn’t explain the incredible variation of his performances among the different caliber of boxers he’s faced. It’s uncanny. 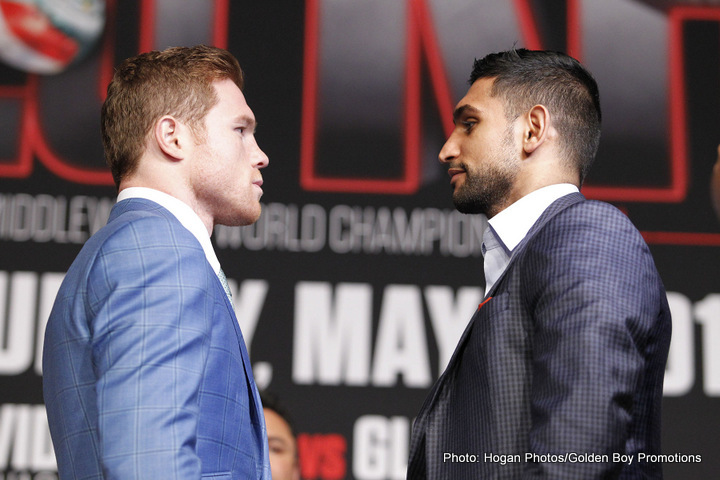 Amir Khan knows that Canelo is the biggest challenge he’s ever faced. He knows that for one of the few times in his career (the only time, perhaps?) that he’s now the underdog. He knows that a bad loss could permanently damage his ability to compete at the elite level. Most importantly though, he knows that this moment demands his undivided focus because when he’s done so in the past, he’s never been anything but successful. If Amir Khan, who has a history of being at his best when he’s not expected to, stays true to form, we just might see him better than he’s ever been. Next boxing news: Andy Ruiz Jr to make ring return next month; you’ll never guess who against!